It goes without saying that social media platforms such as Facebook and Instagram are very popular. Facebook just achieved a landmark milestone yet to 2 billion active monthly users. However, there are still some countries in the world where these services are either not available or banned. Vincenzo Cosenza, an Italian social media strategist, photographer and blogger has been charting the use of all social media platforms around the world. He has created a world map of social networks 2017 based on the traffic from January 2017. As you can see from the map above, Facebook dominates in the western world. Even in Pakistan and India, Facebook continues to be wildly popular. Additionally, Mark Zuckerberg’s platform is also very much popular in Africa, Middle-East and the Pacific region. With a current user base of 2 billion and growing, expect to see more of the places covered in blue during next year. Out of 149 countries, Facebook is leading the social media pack with 119 of them using it the most. Places like Russia, although they have Facebook users, are still dominated by their local social networks, Odnoklassniki and VKontakte (VK). Both of these platforms use the Russian alphabet and are strongly focused on the Russian-speaking community. Some territories like Iran, Namibia, Botwana prefer Instagram. LinkedIn is popular in 9 countries and Instagram is king in 7. QZone is still very popular in China it seems. With around 653 million users, it’s one of the most used and popular social media network in China. Given the huge database that it has, it seems unlikely that QZone is going anywhere since Facebook is banned in China. As for Twitter, it seems that Japan is the only country where the microblogging social media network is the reigning champion. 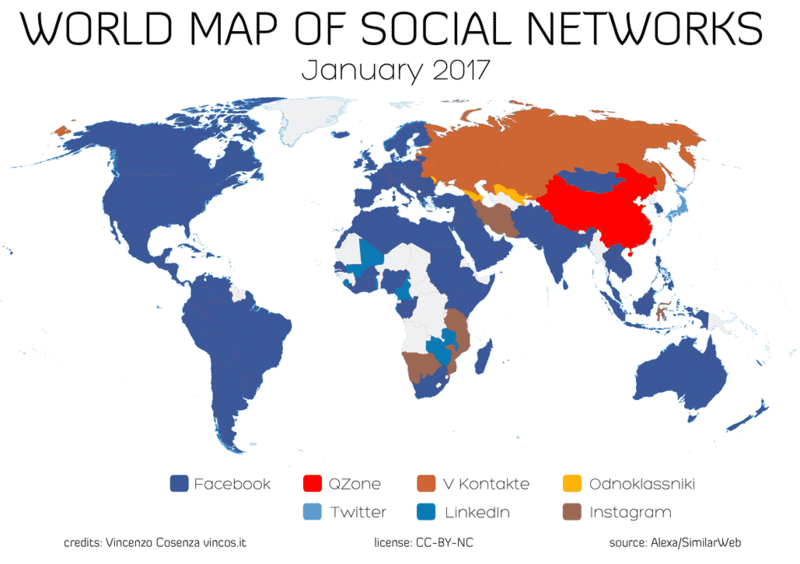 Perhaps the only two networks that are stopping Facebook from total world dominance are QZone and V Kontakte. Qzone (Chinese: QQ空间) is a social networking website which was created by Tencent in 2005. It allows users to write blogs, keep diaries, send photos, listen to music, and watch videos.